A bright smile is one of the foremost things which others notice in you than your eyes, hair and other features of the body. You are never totally dressed up without a beautiful smile. A dull smile can make you go unnoticed or under recognized in the society. When our teeth are overlapping and protruding, it makes us feel even more conscious and put us in an embarrassing position. This types of dental disorders can be overcome by dental braces. Dental braces have come a long way over a period of time. Dental braces are used to correct teeth deformities like overbite, under bite, crowded teeth, straightening the teeth and gapped teeth. A dentist is the right person to decide and suggest what type of dental braces are best suited for ones needs and requirements. Dental braces work by putting pressure to the teeth. An archwire which is like a metal wire takes most of the pressure which is further attached to the tiny brackets placed on the ends of each tooth. Further they are supported by ligatures which are like rubber bands that are tied to the metal brackets to have added pressure on the teeth. Dental braces comes in different varieties keeping in mind the comfort zone and the appearance. If you think you need dental braces, feel free to call us at 772-287-6159. Our friendly and trustworthy dentists will assist you in finding a perfect dental braces as per your convenience, comfort, style and appearance. You can also drive in to our office and schedule an appointment with our dentists. 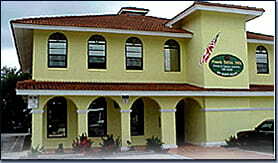 We are based in the city of Stuart in the state of Florida.